Jim Bongartz was born in Pittsburgh, Pennsylvania where he began studies at Carnegie-Mellon University followed by a Bachelor of Science Degree in Art Education at Edinboro University of Pennsylvania. After moving to the Philadelphia area in 1989, he began a twenty two year career as a full time art teacher for a private, special education, K-12 school in Fort Washington, PA. While teaching, Jim kept a working studio in pursuit of his painting career. One of Jim’s treasured accomplishments was maintaining weekly painting sessions with painter Steve Kennedy for over 15 years. Jim turned to acrylics, painting images inspired from his photography referencing how the camera interprets light, color, motion, and time. Allowing the camera to capture an exploratory moment in travel, play or daily life, Jim transforms the graphic nature of photography to a painterly world with bold color and brushwork. Jim is the Director of Education for Artists of Yardley, (AOY) coordinating adult and youth classes and workshops. He also teaches painting classes and youth summer classes. Jim is an active member of ART+10, a Princeton-based artist collaborative and a member of ArtsBridge, Stockton, NJ. 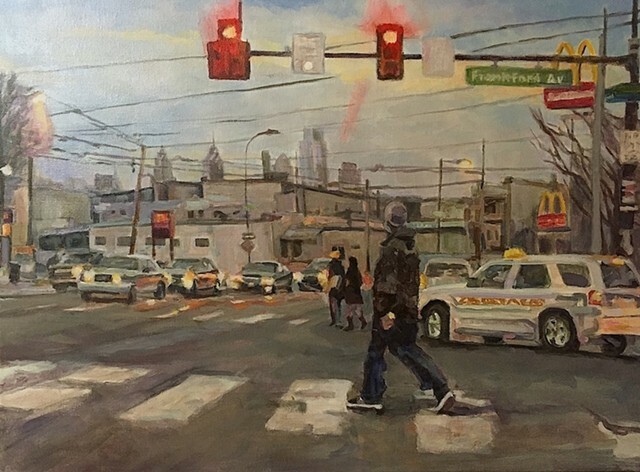 Previous artist associations include the Philadelphia Sketch Club, Greater Norristown Art League and gallery representation in the Philadelphia, New Jersey and Pittsburgh areas. 2018: New Hope Art League Juried Show, Merit Award. 2016 - 2018: AOY 5th, 6th and 7th Annual Juried Exhibit. 2015: 86th Juried Art Exhibition at Phillips' Mill. 2014 : Arts Council of Princeton (ACP), Looking In/Looking Out, Invitational Group Show, Art+10. 2014: AOY 3rd Annual Juried Exhibit, Juror: David Shevlino. 2013 : "Sights and Sounds of Spain", St. Johns Creative Arts Series, Melrose Park, PA, Solo exhibit. 2012: "PLAYBACK", Solo Exhibit, Cafe 44, Princeton, NJ. 2012: "A Slice of Life", ART+10, Group Show, Cafe 44, Princeton NJ. 2009: “The Nature of Things”, St. John’s Lutheran Church, Melrose Park, PA. Solo exhibit. 2008: Newman Gallery, Philadelphia, PA. Members show, Philadelphia Sketch Club. 2007 – 2008: Verde Home, Ambler, PA. Gallery member. 2006 – 2007: Swan Gallery. Gallery member. 2006: Phoenix Village Art Center, Phoenixville, PA. Solo exhibit. 2006: “All Fired Up”, The Plastic Club, Juried Show - Second Prize. 2005: Cheltenham Art Center, Juried Show - Honorable Mention.